The World Economic Forum forecasts a bleak outlook for the future of food, with “unchecked consumption” and “survival of the richest” some some the likely outcomes in a recent report. But there is a better way, says researcher Christop Rupprecht. The World Economic Forum’s 2017 report on the future of food examines what the world’s food systems might look like in 2030. But none of the four future scenarios it presents is particularly attractive. To create a world where everyone can eat well without wrecking the planet, we need better ideas, a rich imagination and the right tools. The WEF report offers four potential scenarios. 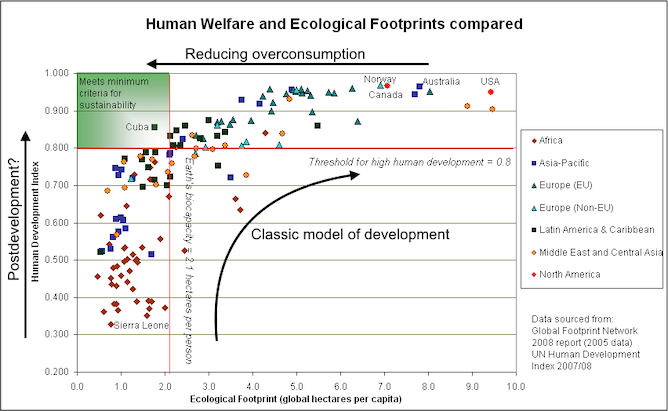 Unchecked consumption: resource-intensive consumption and strong trade cause environmental collapse and extreme global warming, while rich countries and corporations continue to exploit resources worldwide. Survival of the richest: resource-intensive consumption with limited trade and intellectual property rights widen the gap between rich and poor, while environmental problems and climate change worsen. Local is the new global: resource-efficient consumption and limited trade allow resource-rich countries to feed themselves and protect their environment, but countries without good agricultural land face a difficult choice between overusing resources or risking hunger. Open-source sustainability: resource-efficient consumption and strong trade help to provide food while protecting the environment. But relying on produce from around the world means local extreme weather and economic or political shocks affect people worldwide. The report’s authors argue that shifts in demand (towards resource intensive or efficient consumption) and market connectivity are the two critical uncertainties that will influence whether food systems can nutritiously and sustainably feed the 8.5 billion people projected to be living in the planet by 2030. The report emphasises that all its scenarios are possible and all have winners and losers. Even in the open-source sustainability scenario, for instance, some people may not be able to afford the higher price of ecologically priced food, which may include the cost of managing water quality, paying fair wages for workers, and better animal welfare. But it’s unclear if the scenarios are really sustainable; consuming more efficiently may not be enough. The science is clear: we are using more resources than the Earth can regenerate, so to become sustainable we must consume less. There are good reasons why using resources more efficiently isn’t enough. Think of the Earth as a fish pond. In our pond, one new fish is born every day (a regenerating resource). But if we are eating 1.6 fish every day (just as we are currently using 1.6 Earths’ worth of resources), the day will come when the pond will be empty – regardless of how efficiently we cook, preserve and eat the fish. Improved production processes alone also do not reduce absolute resource use. Consuming less remains the most viable option. But our societies and model of development are built on the idea that economic growth and consumption are necessary for a good life. Can we really shift our diets and consumption patterns enough without rethinking this foundation? The solutions the report proposes, such as consumer education, different marketing or new business models, have been tried with only limited success. Local is the new global, the second scenario in the WEF report, assumes resource-efficient consumption is characterised by low market connectivity. According to the report, it avoids the risks of economic and political shocks that the highly connected markets of the Open-source sustainability scenario pose. But this comes at a price. The report’s authors speculate that countries depending on imports will struggle to feed their people without connected markets, while innovations will have trouble spreading. Does this hold water? Open knowledge and technology don’t need markets to work and spread, as Wikipedia and arXiv, home of more than one million scientific articles, have shown. There’s also the question of whether food is a commodity or a common resource everyone has a right to. After all, everyone needs to eat. The report also fails to provide examples of strong institutions that might limit the impacts of market connectivity, such as the threat of transnational corporations dominating the world’s food and seed markets. The right of peoples to healthy and culturally appropriate food produced through ecologically sound and sustainable methods, and their right to define their own food and agriculture systems. To achieve this goal, we need to grow food using agroecology, that is, using knowledge of ecosystems and biodiversity to fix how we practice agriculture. Further, regional food systems based on self-reliance and local currencies would allow for fair trade but also make sure food is always available and accessible. 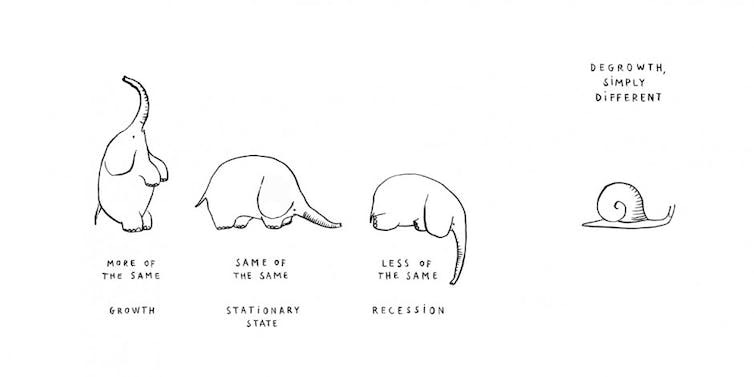 Degrowth, both a concept and movement, aims to use and produce less while increasing human well-being and improving ecological conditions. It could help us move away from over-consumption and the need for growth by redefining happiness socially, not individually. Why not relax and enjoy a good life (or buen vivir) of cooking and eating with friends and family, instead of competing to buy the biggest car or house? With open knowledge sharing instead of patents and restrictive copyright we can freely exchange everything from blueprints for 3D-printed farming tools to open-access textbooks that teach the basics of sustainability or how cities can help create sustainable food systems - without relying on market connectivity to spread innovation. People from around the world have come up with many great ideas how to shape a brighter future. Anthropology researchers use the term “imaginaries” to describe the capacity of people or societies to imagine how things could be different from what they are. The stronger the power of our imagination, the more options and solutions we can come up with to tackle challenging problems. A rich imaginary allows us to easily reject the common political argument that there is no alternative, which, in the context of food, is sometimes used to argue for industrial agriculture. Likewise, if we can envision a brighter future, we can avoid the trap of infernal alternatives – where being confronted with only bad choices leaves us powerless to demand change. So how can we give our imaginaries a good workout? Art and literature, and especially utopian science fiction, such as Ursula K Le Guin’s The Dispossessed or Kim Stanley Robinson’s Mars Trilogy, can serve to start a public discussion about the future. And recently, people have invented participatory tools everyone can use to imagine, plan, and shape a brighter future together, even without being a writer or artist. One simple way is to share and compare our values and beliefs with people around us. 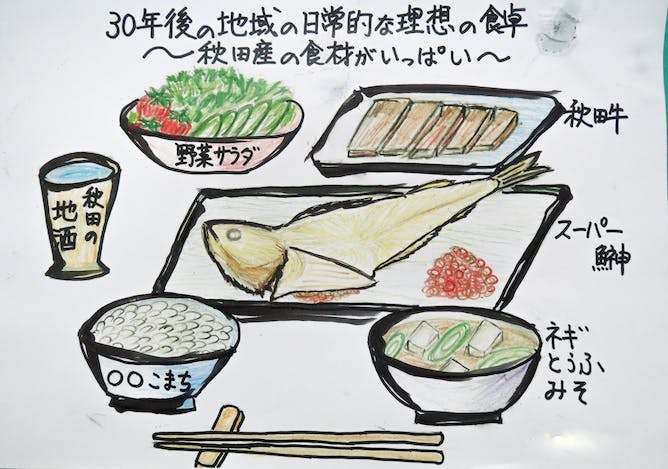 For example, my FEAST project colleagues and I asked hundreds of children and adults at our Research Institute for Humanity and Nature Open House event in Kyoto what “good food” means for them. The answers were both funny and fascinating: from eating chocolate in the middle of the night and traditional Kyoto heirloom vegetables to home-cooked food and meals shared with family and friends. Another great tool to shape the future is backcasting, where you think about what kind of future you want, then identify pathways towards this future. Noshiro is a rural town in northern Japan that’s facing an ageing and declining population but is famous for its delicious rice. Here we held workshops where residents imagined what their personal ideal meal would look like 30 years in the future. 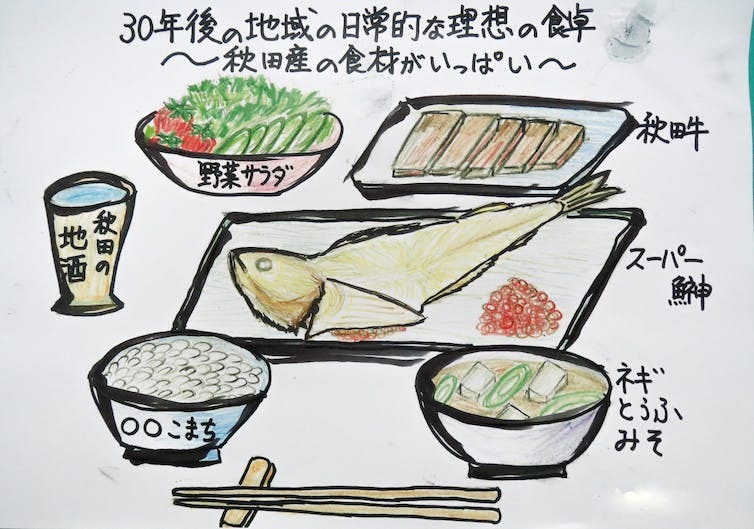 Using drawings of these meals, we then discussed what actions were necessary to make this future a reality. How about you give that a try right now? What ideal meal do you want to eat in 30 years? And what do you need to do to make it happen? Christoph Rupprecht is Project Researcher, Research Institute for Humanity and Nature. This article was originally published on The Conversation.